Once you realize that the scene in the Five of Wands looks more chaotic than it really is, you understand that it could actually be a lot of fun. Seriously, what self-respecting killer wears polka dots to a battle? Just look at the man on the right! Incidentally, the white and blue polka dots represent innocence and intuition. Kabbalistically, the olive green shoes, leggings, and sleeves symbolize juvenile recklessness. You’ll note in the Five of Wands tarot card that all the other boys are wearing red boots, leggings, or shirts, signifying energy and passion. One of the youngsters wears a blue shirt with grape clusters, a symbol of abundance and ecstasy. The Five of Wands’ most serious aspect is that of youthful passion and exuberance. You’re still troubled by the Five of Wands card? Erm, a bunch of unsupervised teenage boys swinging big sticks in the wild is always trouble. Trouble it what they do best. Never mind, you probably don’t want to know. But the astrological correspondence for the Five of Wands tarot card, Saturn in Leo, gives important insights into just how much trouble is being generated here. Yes, chaos and competition definitely come into play. But the energy in the Five of Wands card is also about self-expression and the need to be recognized. Note how these boys in the Five of Wands are armed equally. No one has a knife, and no one brought a gun to this fight. That would be breaking the rules. No one’s wearing protective gear, because no one is supposed to get hurt. The fight stops when the tears start. The Five of Wands only becomes a problem when grown-ups – who should know better – keep bickering like teenagers. Sadly, there are plenty who still do. For example on your favorite political talking heads TV program, on the Internet, or in the workplace. That’s when its Kabbalistic title, Lord of Strife, can have more serious consequences. In a tarot reading, look to the other cards surrounding the Five of Wands to get clues as to whether the Five of Wands is foretelling of garden variety human smack talking or if it is an omen of serious conflict. Don’t bother looking for a safe haven when there’s a pie fight going on around you. The best thing you can do is grab your safety goggles and join the fun. Things are getting messy all right, but no one’s getting hurt – except maybe your pride and only if you let it! Yes, things are chaotic. But if you can roll with the punches, this chaos can be very creative. After all, it’s not every day someone gets to go home wearing a Jackson Pollock painting. The worst thing that can happen is that everything will return to its ordered routine tomorrow. Or are you the kind of person that carries a grudge? Don’t take things personally. No one means any real harm. The energy and meaning in this Wands card reflects what happens during an intense brainstorming session. Everyone is putting their ideas on the table, and these ideas are bound to be as mismatched as the clothes on the youngsters in this card. But that’s what brainstorming is all about. Sorting these ideas out and making sense of them is the work of another day. But if this chaos is starting to feel a bit overwhelming, the Five of Wands tarot card suggests that you need to become more organized. This could well be a matter of you having too many irons in the fire. Prioritize and delegate. You still have time to come up with some brilliant strategies before things get out of hand. Sometimes, this card shows that you are in a very competitive situation, where a lot of people are jostling for attention. At this point, however, no one has broken from the pack. Take a close look at what everyone else is doing, so you can find a way to make your voice heard above the crowd. If you’re wondering what the fallout from a recent argument with a friend or loved one may be, relax! These things happen in the best of families, and you’ll both be laughing about it soon. The chaos brought on by the Five of Wands comes and goes quickly. Unless you’ve been trying to avoid the inevitable, you now have a moment to catch your breath. Sometimes avoiding a conflict can get you out of a nasty scrape. For example, choosing to ignore a bully’s constant taunts may wear him out over time. He may get bored, give up, and look for an easier target who will give him the response he’s looking for. Or he may pick on the wrong person and get what he deserves. But that approach doesn’t work with bill collectors. Blow them off long enough, and they’ll garnish your paycheck or worse, your bank account. When reversed, the Five of Wands tarot card can also show a period of quiet after a recent turmoil. That’s your chance to regroup. Oh, and if you were throwing pies in the cafeteria, it’s also the moment before the principal hands you the mop and bucket. 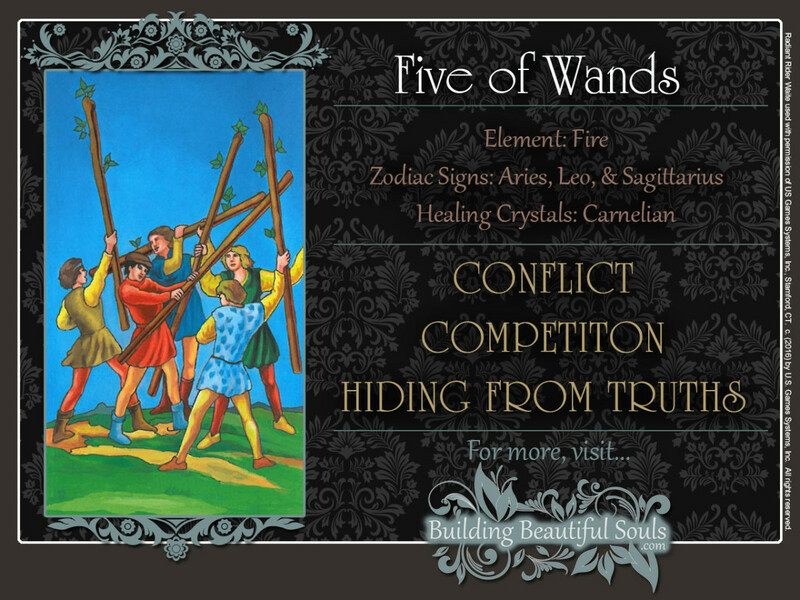 Are you remembering that the scuffle shown is the Five of Wands is supposed to be harmless fun? When you dish it out, you also must be able to take it. You can’t get mad, if your friend tells you a joke about your Momma – not after you’ve already had your turn. That may not be a written rule, but it’s still a rule. Yes, there’s a limit to everything. Tempers often flare when people are passionate about something. Hurtful words can slip out in the heat of the moment. A personal attack during a discussion can put you in the wrong, even if you are right about the facts. Here, the Five of Wands teaches you to be aware of how you come across to others. Kabbalistically, fives are associated with feisty Mars. In traditional Numerology, 5 corresponds to lighthearted Mercury. The combined energies are intense but not life threatening in the Suit of Wands; their bark is much worse than their bite. And remember, the influence of the fives comes and goes quickly.